If you are keen to reduce the saturated fat in this popular Christmas dessert then replace the butter with polyunsaturated margarine and serve it with the low-fat brandy sauce (see below) and/or offer frozen yoghurt rather than cream or ice-cream. This is our family’s favourite recipe. It can be cooked in advance and frozen until required. If there is any left over for Boxing Day the brandy sauce is a wonderful low-fat dessert which is great served cold with berries and yoghurt. Take a large saucepan and quarter fill with water and bring to the boil. Put the margarine, sugar and milk into a saucepan and add the dried fruit, and bring to the boil. Remove from the heat and add the baking soda. Allow it to foam. Sift in the flour, spices and salt, plus the lightly beaten egg. Mix lightly with a wooden spoon to blend. Pour the mixture into the lined pudding bowl. Cover with a grease proof paper and a greased fitting lid. Lower the pudding into the saucepan of boiling water. The water should come up to approximately half the side of the pudding bowl. Steam for 1½ – 2 hours. Note: If making the pudding in advance allow it to cool and then tip it out of the metal bowl and onto a plate leaving the greased paper on. Wrap the pudding in cling film and store in the refrigerator for 1-2 days or freeze until required. When ready to re-heat return to the pudding bowl and boil up again or microwave. Upend the pudding onto a plate as mentioned above and remove the grease proof paper from the heated pudding. Add coins or a pudding doll (that you have boiled up first) if you wish. Pour the brandy into a small pot and heat slightly. Pour the brandy over the pudding then strike a match near the pudding to ignite the brandy as it soaks into the pudding. 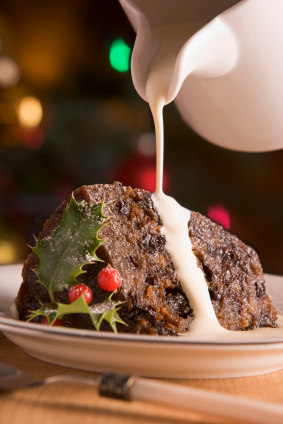 Top the pudding with holly and serve with warm brandy sauce and frozen yoghurt. Pour the milk into a large glass jug and add the cornflour, vanilla, sugar, margarine and salt. Microwave for 15 minutes or until thickened stopping every 5 minutes or so to whisk. Stir in the beaten egg and microwave for a further 5 minutes. Stir in the brandy and serve. Note: This sauce thickens as it cools. If you are concerned about your kilocalorie intake over Christmas then replace the brandy with 2 tsp brandy essence. Each serving contains: Energy 505 kJ/ 120Kcals, Protein 7g, Fat 1g, Carbohydrate 17g, Sodium 135mgs, Alcohol 1.3g.